This is the 3rd Titanic made by COBI starting with COBI 1912, the design was improved with the COBI 1913, and now with the COBI 1914. Not because the first version failed. It was in fact a resounding success, but because the designers felt they could improve the model and the COBI management chose to put improvement before extra profit. The R.M.S. Titanic is a beautiful model of the legendary liner which tragically sank on its maiden voyage in 1912. 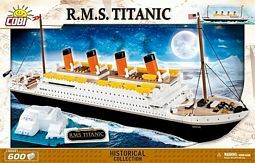 This 600 piece model is equally suited as a toy or ornament and will bring pleasure to poetical ship builder's young and old alike. COBI designers worked on every detail to create a perfect reflection of this magnificent ship. As the original, the COBI ship has 4 chimneys, ship diffusers, numerous decks, lifeboats, masts, and rotating propellers. Additionally, there is a possibility of installing wheels which enable you to play with the ship on the floor. The set contains 600 pieces. After being built, the model is over 24 inches long and almost 7 inches high. This item is a great addition to the extended COBI collection.